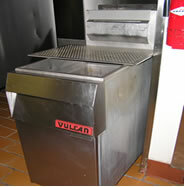 We provide safe and effective cleaning and disinfection for professional kitchens in bars, restaurants and staff canteens as well as domestic kitchens. Every kitchen needs periodic deep cleaning. Whether done annually, six monthly or quarterly, regular deep cleaning removes the build up of grime and food waste residue that gets left in corners and hard to reach places. No matter how effective your daily, weekly or monthly cleaning routines are there will be a progressive accumulation of soil, particularly grease on less accessible surfaces. Notably canopies, ducts, light fittings, floors, walls behind equipment and ceilings. This operation generally requires the services of a professional contractor. 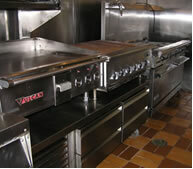 A deep cleaned kitchen is not only more hygienic but raises the morale of the staff who work in them. Kitchen deep cleaning is scheduled to fit around the needs of the caterer, with no extra charges made for weekends or overnight cleans. Trained cleaning technicians will arrive at a time best suited to you to thoroughly deep clean your kitchen and bring it up to a standard that you will be proud of. 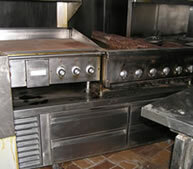 Kitchen deep cleaning is tailored to suit the individual needs of the caterer. 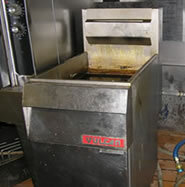 This encompasses structural cleans, high level work, ventilation canopy's, hot cooking equipment, ancillary equipment, floors and complete kitchen deep cleans.